I absolutely loved this commission. On paper it was potentially full of complications. Portraits of 2 brothers – one of 15, one of 9. The 15 year old is very much a young man, tall and long-limbed and rather camera shy. The 8 year old – a chorister at Salisbury cathedral – is a young boy, full of life and confidence, and angelic. Two very different sitters. How to create two portraits that can work alongside each other, taking the very different scales into account? Particularly when the poses that I ended up choosing only served to emphasise the differences. A portrait sitting is a very organic process and you never know how it is going to work out. I always ask my clients to email me a paragraph to describe the sitter/sitters which give me an insight into the personalities involved and therefore a head start. But quite often when they turn up for the sitting it is the first time we have met. So the pressure is on to find a pose/expression that captures the pose in a rather short period of time. Sometimes the client comes to the sitting with a very strong idea of what they want, and more often than not leaves with something quite different as the story unfolds. It is vital to keep an open mind. 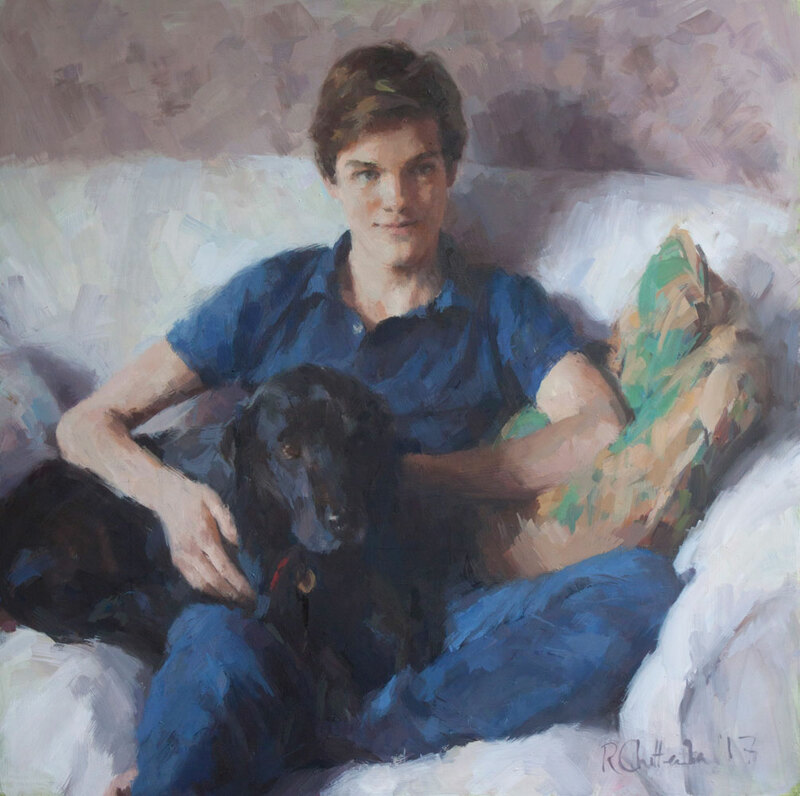 In this case, Fiona, the boys’ mother, was completely undecided as to size – head and shoulders or a full body, individual or a double portrait (or even triple, including Daisy the dog)); and to medium – oils or pastels. So we just jumped straight in and tried it all, and over the course of the morning our we found our route. Despite the early start and forewarned reluctance of the subjects, these boys were an absolute delight from start to finish. They entered into the spirit of the sitting wholeheartedly. Initially camera-shy, James was far more at ease when he had the very obliging black labrador, Daisy, alongside. We got some lovely images of him with just head and shoulders, but it was when we included the whole body (and Daisy) that the magic started to appear. The counterpoint of long slender limbs, all angular, lend a quiet energy that captures his personality. Initially the plan was to paint Sammy in his chorister robes but, as soon as he put them on, he became a different child. The lively, relaxed and slightly mischievous boy was replaced by a serious, albeit enchanting, cherub. Trying to get a pose that wasn’t contrived or “chocolate boxy” was really very difficult. We ended up agreeing, Sammy included, that an off-duty pose, lovely and relaxed on the sofa, was a better solution. Poses agreed, I realised that the scale issue was going to be something that needed to be addressed from the start. Not only is Sammy appreciably smaller than his brother, but also, the pose is smaller – James is sprawled with the dog and Sammy is on his own and much more contained, so emphasising the already different scales of the two brothers. Could either have the canvasses roughly the same size with James therefore being significantly smaller than his brother, or be true to size in which case Sammy would be dramatically smaller being already small and with a small pose. Or find some compromise so that they work optically together, with Sammy being bigger proportionally than in reality. The solution I chose was to scale it optically. Sammy is proportionally bigger in his painting than in reality and in relation to his brother. His canvas is still smaller but somehow he appears to be the same size. Also, the colours of Sammy’s portrait are louder and more vibrant lending more weight. Given that the paintings will not be hanging alongside each other, I feel that this is the best solution. These two brothers have such a lovely, easy and close relationship, despite the large age gap. And I hope that although the portraits are separate, this is somehow conveyed through the unity of palette, and the openness of the poses and the way the two portraits relate to each other. I loved every stage of this commission from the sitting itself, through each stage of the paintings to their final conclusion and am delighted with the result. Two individual portraits of brothers that work well separately and together. See here for more examples of my portraits of children. 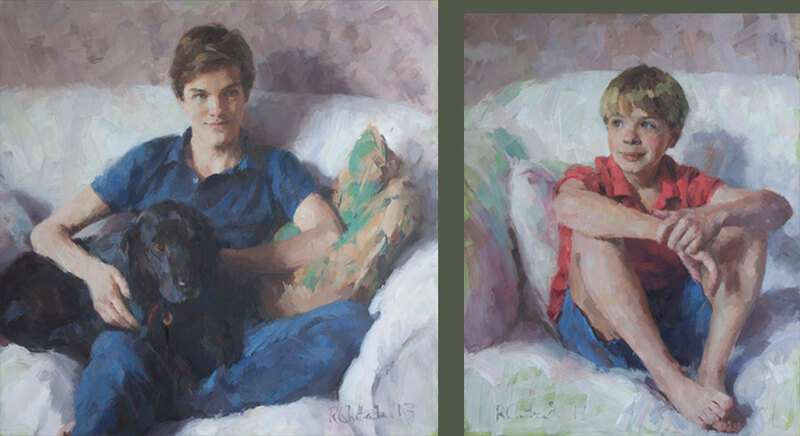 If you would like more information about commissioning a portrait click here. Or if you have any other questions, do please contact me here.